What does “thermodynamic equilibrium” mean for an enzyme-substrate complex? The Michaelis-Menten mechanism assumes that the enzyme-substrate complex is in thermodynamic equilibrium with free enzyme and substrate. where "product" would be referring to [ES] and "reactant" to [E] and [S]. Does that make sense? This was the initial assumption in the Michaelis-Menten model. Not the answer you're looking for? Browse other questions tagged enzymes enzyme-kinetics or ask your own question. What is the correct model for enzyme-substrate complementarity? 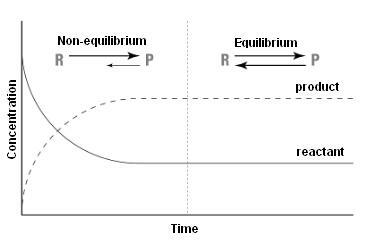 What does enzymatic equilibrium in % represent?